The Focke Wulf 58 Weihe (Kite) was an important plane of the Luftwaffe during WW II, seeing widespread use (by other countries too) in a variety of duties such as transport, liaison, training, ambulance, flight testing, patrol, attack and even crop dusting. The prototype, FW-58 V-1, D-ABEM, flew in 1935, around 5,000 being built in the “A” (very few), “B” and “C” versions, the latter the most important operationally. There were some “B” version examples with factory installed floats, designated FW-58BW. The German pilots called it Leukoplast-bomber (sticking-plaster bomber), but it was a very reliable aircraft, present on all Fronts. 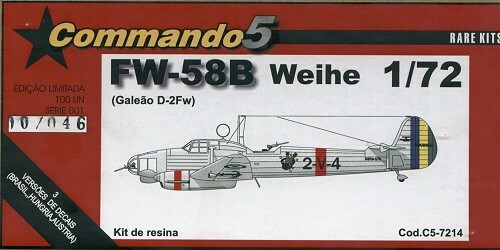 Brazil, before political alignment with the USA, was granted manufacturing licences of Focke Wulf aircraft like the FW-44 Stieglitz and the FW-58 Weihe, which were being built in the Galeão plant, in Rio de Janeiro. It is an airplane long awaited in 1/72 kit form, and now it is available thanks to this Comando 5 release, which brings us the “B” version (Brazilian-built planes were designated “Galeão D-2Fw”). The model has more than 40 high quality resin parts, with excellent surface finishing and no bubbles. The components, even the smallest ones, are very well detailed (pilot´s seat comes with raised seat belts plus buckles! ), comparing favourably with similar injection molded kits and even surpassing some of them! Each part has adequate spacing from the matrix-block typical of these kits, allowing detachment with little or no risk of damage. 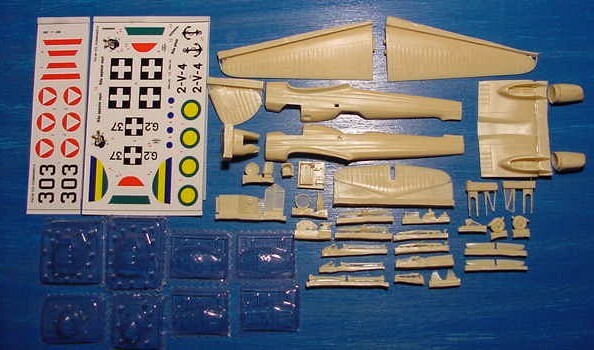 The fitting is very good for a resin kit, permitting a good alignment even for beginners – for example, each wing has two strong pins which are to be plugged to corresponding recesses on the fuselage, and the landing gear legs are reinforced by metal rods, a good solution for ‘tiny’ pieces. Four acetate clear parts sets are provided, with an extra copy of each one, all with proper raised frames, making masking easy for painting by airbrushing and by brush. The Portuguese / English instructions sheets are clear and precise, with six construction steps plus another for each version painting scheme, besides two extra sheets, one about resin/metal modelling hints and another dealing with “filmless” decals. Decals (two sheets) are of the “Wet Transfer” type (the film is totally removed after applying decal, resting only the marking itself – the effect is equal to a dry transfering) from FCM Decals, well printed, with centered insignia. 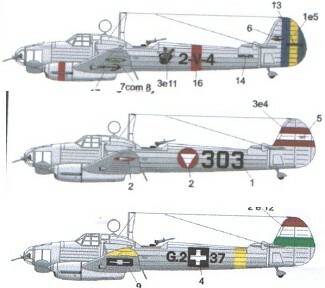 Three versions are available : Brazilian Navy (based at Rio de Janeiro coast, 1940), Hungarian Air Force (Eastern Front, 1943) and Austrian Air Force (1937). A rare and important aircraft, presented here by a good kit that will probably stimulate all modellers, resin-oriented or not.